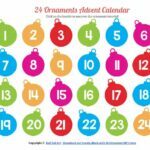 Welcome to Day 6 of the Creative Christmas Countdown – a virtual advent calendar to keep you and your kids busy this advent season (as if you are not busy enough, right?! Hehehe). 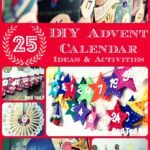 The activities are designed to be simple, fun things you can do at home to make advent MAGICAL. 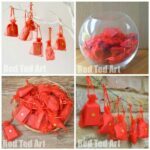 Brought to you by Creative With Kids , Red Ted Art and 24 wonderful Kid Bloggers. Today I have the pleasure of bringing you Imagination Soup and her DIY Christmas Storybooks. I can’t wait to head over and take a closer look. If you haven’t visited Imagination Soup’s website before, it really is about time you did – packed with wonderful and fun ideas to get your children reading, writing and creating, it really is a wonderful resource for parents and teachers alike. Fabulous to have Imagination Soup join in today! 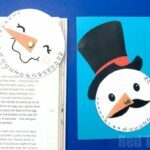 Click though to DIY Christmas Storybooks, to read all about the story books and to get your kids TELLING STORIES! Tip of the Day: STORY TELLING! Some children (and adults) are natural story tellers, others find it really hard. If you want to help your child to develop their story telling skills, keep it simple. Some of my favourite ways to get my kids talking, is to ask them about their day every evening – they then go and step through the days event hour by hour – sometimes they find it easier, other times they get their days muddled. Talking about their day helps them learn to express themselves, a key part to story telling. To help them with made up stories, we like to play simple three words and I try and get them to make a sentence with the words given. Similarly you can use story cubes or pictures in a magazine. Today’s activity is BRILLIANT for nurturing storytelling. The key thing is – to simply give it a go. Regularly and to try and have fun! 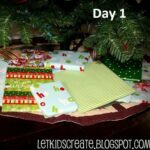 Be sure to come back tomorrow and visit Alissa over on Creative With Kids for Day 7 of your Creative Christmas Countdown! Do leave a comment below and let us know how you are enjoying the calendar to date! We would love to hear from you. I agree we could use some help in story telling thanks for the activity.